#JoinTheAgenda has a new mission. Get your Pinterest boards ready! 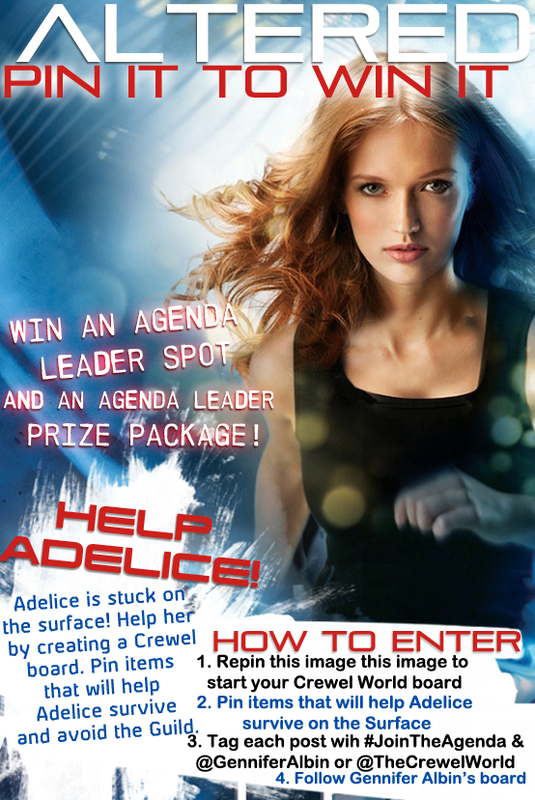 Adelice is stuck on the Surface. Help her by creating a Crewel World board. Pin items that will help Adelice survive on the Surface and avoid the Guild. Pin items that will help survive on the Surface. It really can be any item you think will help. Don't worry if you think the item might not really exist within the Crewel World. It's the thought that counts! Tag each of your new pins with #JoinTheAgenda and @GenniferAlbin (or @gennalbin for her Pinterest account) or @TheCrewelWorld. Follow Gennifer Albin's pinterest board. You'll win a coveted Agenda Leader spot and an Agenda Leader prize package! This contest is open from today (September 25th) to October 13th. So you have a little over two weeks! The current Agenda Leaders will still be watching #JoinTheAgenda tags on twitter, tumblr, and everywhere else throughout this event. If you're really stepping up, you could still snag an Agenda Leader spot!